Chicago Public Schools is paying nearly $9 million to rehab a vacant post office garage into a new South Loop elementary school. SOUTH LOOP — South Loop Elementary School is getting a new building. South Loop Elementary, 1212 S. Plymouth Court, opened for 580 students in 1988 but now has 839, according to Chicago Public Schools. And the South Loop, one of the few city neighborhoods growing in population, is slated for thousands of new homes arriving in the next decade. The new school will accommodate up to 1,200 students. "The new building would alleviate current overcrowding, while also accounting for future population growth in the area," CPS spokesman Michael Passman said in a statement. 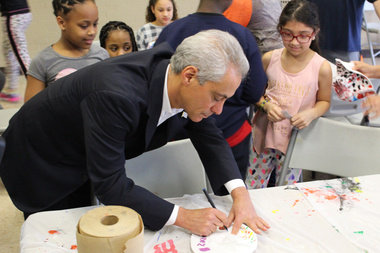 Parents had decried the school's overcrowding for years, and Mayor Rahm Emanuel reportedly met privately with neighbors recently to outline a plan to solve the problem. The school district is paying an estimated $8.7 million in tax-increment financing funds to finance the project. CPS said South Loop Elementary is at 126 percent capacity, a figure that stood to worsen as thousands of new homes get built over the next few years in the neighborhood. A developer closed its purchase of a massive 62-acre development site at Clark and Roosevelt streets earlier this month. CPS did not share when construction of the new school building would start, but the project is expected to take three years, according to Tara Shelton, South Loop Elementary's principal. "I know that your hard work contributed to these exciting plans for South Loop School," Shelton wrote to parents Thursday. "We will be forever grateful for all the work that has gotten us to this point."